An Orbital ATK Antares rocket will launch a Cygnus cargo ship to the International Space Station for NASA on Monday, May 21, 2018, after a 24-hour delay. 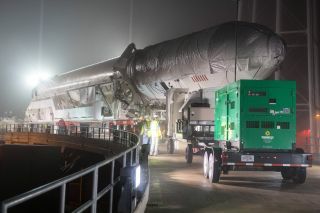 Here, the rocket is rolled out to its launchpad at NASA's Wallops Flight Facility on Wallops Island, Virginia, on May 17. NASA and Orbital ATK have postponed this weekend's planned launch of a cargo ship to the International Space Station by 24 hours, with the liftoff now targeted for no earlier than Monday (May 21). In a statement, Orbital ATK representatives said the delay will "support further pre-launch inspections and more favorable weather conditions." There is an 80-percent chance of good weather on Monday, they added. Orbital ATK rolled the Antares rocket and its Cygnus payload to Pad-0A at NASA Wallops' Mid-Atlantic Regional Spaceport late Thursday (May 17). The Cygnus is packed with 7,385 lbs. (3,350 kilograms) of science experiments, food and other supplies for the Expedition 55 crew aboard the International Space Station. This is Orbital ATK's ninth Cygnus cargo delivery mission to the station under a NASA resupply contract. The Cygnus spacecraft is an uncrewed cargo ship designed to ferry cargo to the space station, and then depart with trash or other unneeded items and burn up in Earth's atmosphere. Dulles, Virginia-based Orbital ATK has named this Cygnus the S.S. J.R. Thompson in honor of J.R. Thompson, a former NASA director and Orbital ATK executive who died last November. Weather permitting, Monday's launch may be visible to spectators along the U.S. East Coast. You can see our viewing guide here. You can also watch the launch live on Space.com, courtesy of NASA TV. NASA's webcast is expected to begin by 4 a.m. EDT (0800 GMT).